Apparently, the blur of the lineup is an inevitable process, whatever products it went. Neither Apple, with its iPhone X/8/SE this has not escaped, nor Leica, the camera which now can simply be lost or Fujifilm. The company, which from the start of its X-series relied on its exclusivity and exclusivity, gradually spawn entities, to understand that the move is not so simple. For example, Fujifilm is now just three “flagship”, so to speak in relation to photography. Along with the classic X-Pro2 with hybrid viewfinder brand also offers sequential X-T2, and now X-H1 – both more traditional with the digital viewfinder located in the center, as in the classic SLRs. To understand the difference in their positioning difficult, especially as the price and speed of serial shooting and how they used the sensor and the AF system, these cameras are identical. Key differences of the new items is the above – mentioned stabilization system according to the matrix, changed the ergonomics (it is the largest chamber in the family Fujifilm), monochrome information display on the top panel, improved viewfinder, and advanced functionality while recording a video. The latter can be considered Videoprocessor factor – in fact, this is the first Fujifilm camera, which seriously proposes to use for the video. Prior to that, the ability to shoot videos for Fuji was purely secondary. How X-H1 will change the situation on the market of universal machines for photo and video and how it will affect the perception of the company as a whole? Here including this is what we will discuss in the review. Fujifilm X-H1 in the endless debates about comparing mirrorless and SLR cameras now necessarily fall in the same League with the a-series Sony and Panasonic GH5 – how necessary example of soft irony about the size delivered from the pentaprism devices. X-H1 is really very big – perhaps not by far the largest “mirrorless” on the market, but definitely one of them. Here the ledge for grip in the manner of a full-frame DSLR, and impressive information screen, and the hump, which is hidden in the electronic viewfinder. Obviously, in the case of X-H1 developers are not aiming to create a compact camera, shifting their priorities towards ergonomics. Of course, the analog characteristics of Fuji on the ground, on the top panel are the selector, both two-storeyed. To offer change the aperture using the ring on the lens. The back screen – turning, not only in the vertical plane, but with the possibility of deviation as the X-T2. Buttons are freely scattered on the body. The ring exposure compensation, X-H1 missed due to all of the same information screen – still make this model in very very very heavy monster Fujifilm is not going to. Dimensions of Fujifilm X-H1 – 139,8 × 97,3 × 85,5 mm. For comparison, the X-T2 – 132,5 × 91,8 × 49,2 mm. Immediately attracts the eye the thickness of the body is the price for a great ledge to grab. No compromise and need to buy an optional handle to work with X-H1 is really comfortable. You can hold it in one hand and shoot offhand, impacting and conduct carefully when shooting movies. It’s really a “mirror” level of comfort comparable with what we get from Lumix GH5 – hardly probable not the main competitor of new items according to Fujifilm. The weight of Fujifilm X-H1 also commands respect (and a little frustration) – 673 grams. Color is only one, alas. Fujifilm this time is extremely serious, no flirting with a retro style. So X-H1 can only be black. Exquisitely beautiful, as, for example, all series model X100, it won’t be called is a brutal tool. If necessary, you can still add him to the rigors of buying and installing the optional handle vertical grip. In addition to the two extra batteries and keys-doubles, a pair of connectors hid socket for external charger and headphone output. Like a pen, and the camera itself is protected from moisture and dust. Chassis X-H1 is made of magnesium alloy. The margin of safety and resistance to various external influences should be sufficient for any photographer. Although to test in different climatic and weather conditions I have not had the opportunity, I can say that at least in the cold and snow when she passes. I wonder how does X-H1 in the pouring rain?.. Should normally cover all of padded rubber, adjacent to the sockets tightly. On the front panel of the Fujifilm X-H1 is a bayonet mount with button release lens shape, focus mode switch, the first selector disk soft key, the sync terminal to flash and the led of the AF-assist illuminator. On the left under a single cover are all hidden connectors: 3.5 mm for external microphone, USB 3.0 port (microUSB) and microHDMI (Type D). On the right there are two slots for memory cards standard SD. Both work with cards UHS-II is still a real rarity. In the upper panel we see the aforementioned dual selectors – left is responsible for adjusting the ISO (the basis for the modes of broach/video), right – for exposure (base – metering). In between the multifunction connector type “hot Shoe” located on the protrusion for the viewfinder, which is inscribed on the sides of the hole stereo microphones. To the right – the button of descent with the uvula of switch button to activate the input exposure compensation, and information monochrome screen with a button that changes the type of illumination (light or dark). Bottom — the battery compartment and memory card and thread for the tripod site. They are located far away from each other – you can change the battery directly installed on a tripod the camera. In Brehna part of the rear panel, right in the center of a window of the electronic viewfinder with a proximity sensor and diopter adjustment wheel. Left – key of the playback and deletion of images. Right – button exposure lock and autofocus, as well as the second selector disk. Below we see inscribed in a ledge for your thumb to press the call key quick menu joystick control focus points, five-way navigation key and the button to change the displayed information. And of course, the display – hinge artful design and touch surface. One would expect that the large body X-H1 will allow Fujifilm, which has long been known for its flexible and sharpened by the minimal use of menu control, to arrange the most convenient scheme. But turned out, alas, exactly the opposite. Yes, it uses a well-tested scheme with analog adjustment expobar, ISO selector – not once, but “two-story” adjustment ring implemented successfully, as well as the buttons lock selectors. Problems in the details. Missing switch exposure compensation tried to replace a combination of “lock button on the top panel and turn the disk on the back” – it can be used, but are these two elements relative to each other unsuccessfully, have to spread his fingers in an unnatural position. Quick menu in the form of a matrix with instant change settings without going into the submenu, as always, conveniently, but the button to activate it is located just a failure – falls directly under the thumb. Not once and not even ten at the time of testing I couldn’t quickly change some settings, because I didn’t understand what prevents me accidentally squeezed the button with the letter Q. Rare in the world of serious photography ergonomic blunder. Another oddity is the use of the touch screen – it is used here or select the focus point, or to shutter/start recording, the main menu is disabled. The rest of the control X-H1 is quite familiar to people with experience of using cameras Fujifilm. Even got a couple of bonuses like the joystick for quick focus point selection, two selectors, responsive to the pressing, and the large number of programmable elements. On the Live View screen can display a grid, virtual horizon, histogram – all this really subtle way is configured via the main menu. If you prefer to build the frame only through the viewfinder, the screen can display the basic settings. The main interface, retained the logic of the latest models. There is a section “My menu” where you can register up to 16 regularly used functions. Saved and dignity (the ability to move quickly between sections), and disadvantages – some illogical settings location. For example, setting up Wi-Fi and activationcodes in different places. Display on X-H1 reason is more simple than X-T2 or X-Pro2 is an LCD matrix with a diagonal of 3 inches and a resolution of 1 040 thousand points is a three-inch LCD with a resolution of 1 620 thousand points. Explanation for this just yet – probably had something to save. But there is a hinge that allows you to change the screen position in two planes — in the manner of the same X-T2. If you get used to an unusual pattern (to turn the screen sideways, you move the latch), to use it quite comfortably. To the brightness and color reproduction no complaints. But the viewfinder on the X-H1 is very good. Yes, it is not hybrid as the X-Pro2 (ought to be it has its own unique features), but in a digital League he can walk among the leaders – 0.5 inch, 3 690 thousand points, 100% coverage, the magnification of 0.75 x. Unfortunately, to provide the same level of comfort as an optical viewfinder, it may not: even though the picture is updated with high frequency and not particularly strobic, the delay is still felt. But by the standards of EVI it is really good. 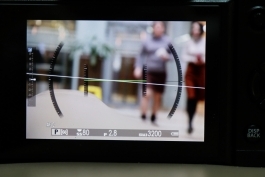 Separately, I note its location in the center with a projection – unlike the situations with the X-Pro2 and X-series E, do not hit the nose at the screen. The Eyecup is comfortable, the proximity sensor is not over sensitive like the cameras Sony a series, is to disable auto switching between the viewfinder and the display is not drawn.